The Note Exchange solution lets you to publish content from ConceptDraw MINDMAP to your Evernote account. To use it, you will need ConceptDraw MINDMAP and the Note Exchange solution installed. On Windows: Choose Send Map from the Evernote button drop-down menu. Find it in the Share tab. On macOS: Select the same command in the Topic menu. 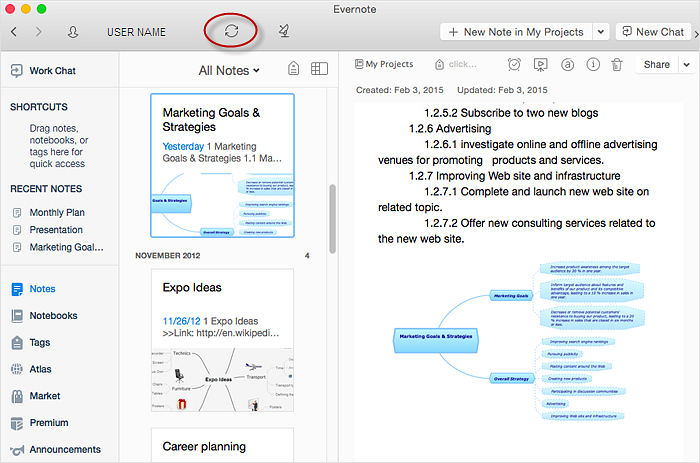 The new Note that contains the mind map outline and preview image will appear in the Evernote local client window immediately. Press the Sync button on the Evernote toolbar. Result: You have a new text Note and image added to your Evernote storage that can be shared with other Evernote users. ConceptDraw MINDMAP supports sending the information from your mind map to your Evernote account. Your mind map information is synced to all of your devices for ease of access. Upload to Evernote® selected mind map topics or the entire documents. Access mind maps anywhere, on any computer or mobile devicevia Evernote®.